One sees lots of articles describing inductors and transformers wound on rectangular cross section ferrite cores, and in explanations, the OD seems to be an important parameter but little consideration is given to ID. Inductance of an inductor on a rectangular toroidal core depends on many factors, and among them ID and OD. Inductance is proportional to ln(OD/ID). 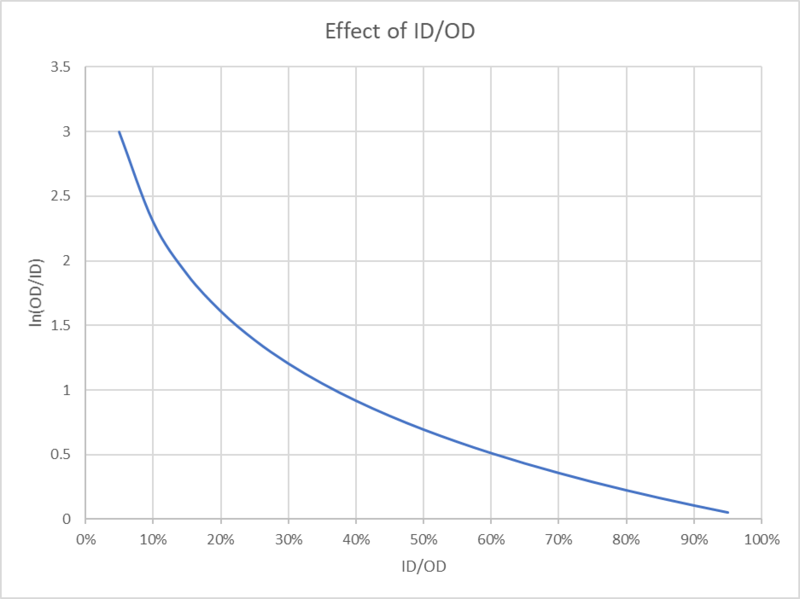 Above is a plot of the factor ln(OD/ID) against ID/OD as a percentage. It can be seen that for ID/OD approaching unity (ie a radially ‘thin’ toroidal core) that the characteristic is almost linear, and inductance is proportional to the radial thickness of the core. 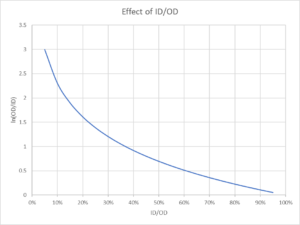 As the ratio ID/OD is reduced (ie the ID is smaller relative to the OD), inductance increases more rapidly with decreasing ID/OD (or increasing radial thickness). The inference is that the inner part of the core carries more flux… and it does because the circumferential flux path length is smaller and the applied mmf generates more flux than in the outer part of the core… it is basic magnetism. So in RF inductors where you want short windings to avoid current phase variation, cores that deliver higher inductance with fewer turns require higher ln(OD/ID) or smaller ID/OD. 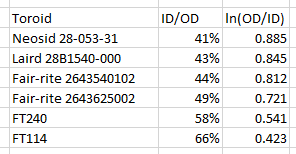 Above is a table of calculated ln(OD/ID) for a sample of cores. Note that the poorest is the FT114 which is very popular in ham balun and unun projects, and at nearly double that ln(OD/ID) is the Neosid 28-053-31 use in Design / build project: Guanella 1:1 ‘tuner balun’ for HF – #1. Clearly the third physical dimension plays into the inductance, as does the complex permeability, and all these factors should be considered in design. You might ask why not just use a small core so that ID is small, and OD is small. That may give the required inductance with shorter wire (less phase variation), but with small surface area so it may not be suited to applications where significant power is dissipated as heat.